Adding a cottage party, wood and glass to better enjoy the scenery. A farmhouse and barn 300m, in nature, in 65 private acres, with sources in the uplands, pine forests, forest hiking trails in untouched nature. You will stay in a house on two levels for 4 / 5personnes 300m from our house. It is an old barn of 80m2 as we transformed the cottage terrace with a glass part to enjoy the unique landscape and accommodate 1 or 2 more visitors. To get there, the great national must be taken on a small paved road 4 km, then access via a private road .. The first level is plein- foot and includes 2 parts: the first large with kitchen and dining / living room with sofa bed. Separated: at bottom: .a bedroom and a bathroom. The second level is a clear loft (5m60 + 3m20): extra room that has 2 beds of 90. In parks: 1 donkey, 1 dog and 1 cat. Your pets, they are clean and kind are accepted. a bathroom with shower, sink, w. c storage shelves. small closet. washing machine. CLOSE the 'perched village' of Montclar on gervanne (4 km) clinging to the hills facing the valley Charsac and pretty creek QUIET, NATURE, ECOLOGY with its natural sources coming from the Vercors. , Horseback riding, golf, forest walks ..
Large property of 50 hectares private, house altitude: 400m, completely independent with private access road. 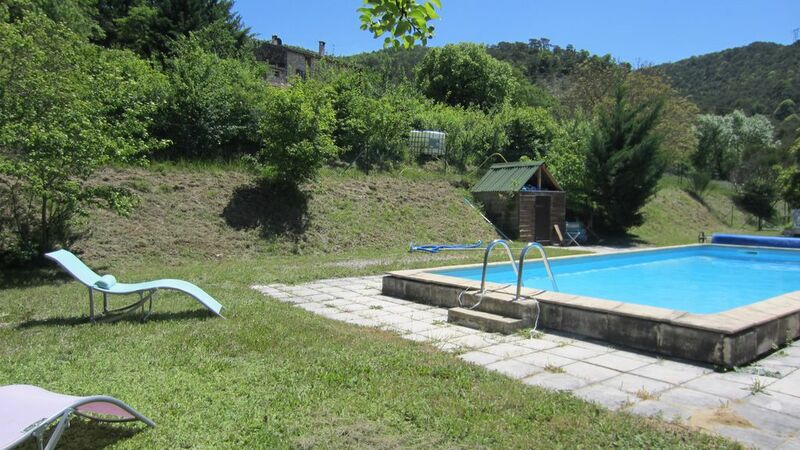 Pool 250m in the property, games, hiking nearby, forests.